Unbeelievable Health | What’s the Big Buzz on Bee Pollen for Health and Energy? 18 Jan What’s the Big Buzz on Bee Pollen for Health and Energy? Bee pollen is one of the queen bees of natural nutrients. Bee pollen is known to be the richest source of vitamins found in nature in a single food1! Not only does it contain 40% of highly absorbable protein (more than any animal protein contains)2, bee pollen also has a wide range of health enhancing plant metabolites, known for yielding energy3. According to Alex Woodly, who was the executive director of the prestigious Education Athletic Club in Philadelphia, “Bee pollen works, and it works perfectly. Pollen allows athletes to increase their strength and stamina up to 25 percent. This increase in strength and endurance may be the key to the secret regenerative power of bee pollen’2. And The British Sports Council recorded increases in strength of as high as 40 to 50 percent in those taking bee pollen regularly2. So no wonder it was also considered an energy and nutritive tonic in Chinese medicine2. Bee Energised energy & focus supplement combines the best quality ingredients to help with energy and focus with organic bee pollen, sustainably sourced from an organic farm in the pristine Galician hills of Spain, as well as organic Spirulina, Ginseng and organic Matcha Green Tea- also known for its positive effects on focus and energy. The combination of the l-theanine with the caffeine improve attention4, but without the jitters of caffeine alone due to l-theanine’s relaxing effect5. Matcha green tea, which uses the whole leaf and a powdering process, also contains more than 3 times as much EGCG as normal green tea6. 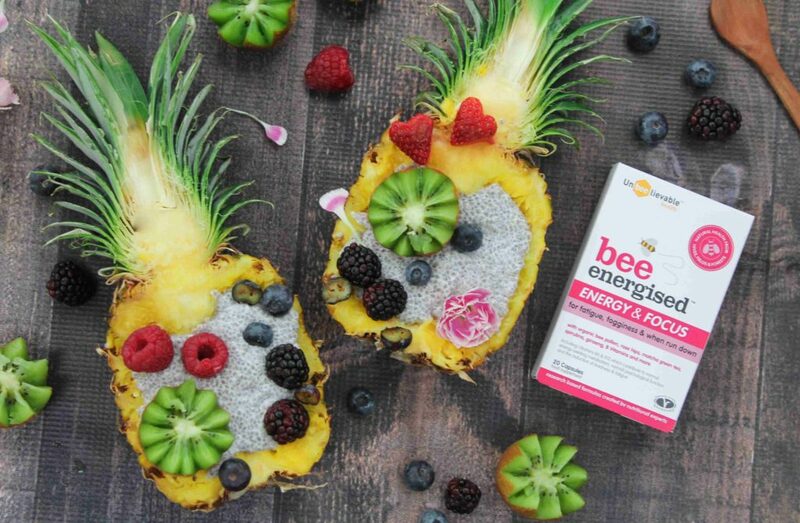 Foodie idea- add capsule contents of Bee Energised to smoothies & more!